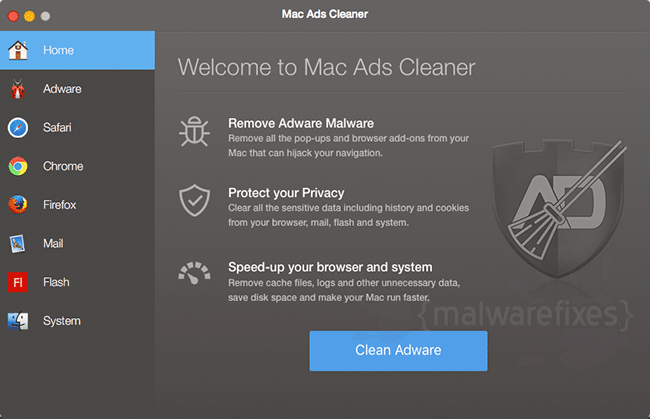 Mac Ads Cleaner is a suspicious computer utility software made specifically for Mac systems. It can be installed on the computer even without user’s consent. Attacker usually bundled this rogue program to a number of freeware and shareware currently deployed on the internet. Browser redirects is also used to drive user into promotional website that entices them to install Mac Ads Cleaner. Said website will impose various deceiving tricks in convincing visitors to download and install the application. Once running on the computer, Mac Ads Cleaner may run a scan from time-to-time. In order for this program to ploy user into buying the paid version, it will send alerts about certain issues found on the computer. This illusory scheme is commonly used by rogue software to gain profit by selling worthless application. In general, Mac Ads Cleaner is endorsed as a Macintosh utility program with striking features such as System Cleaner, App Optimizer, Uninstaller, Duplicates Finder, Internet Privacy, Shredder, and many more. It appears to be a prominent tool but it is alarming to know that it is affiliated to some PUP’s and Adware, which it uses as a way to spread copy of the program. As of now, makers of Mac Ads Cleaner is promoted and sold without any valid evidence of its effectiveness in optimizing the computer. In fact, there are various copies of this adware that shares the same scheme. Thus, it is still unsafe to trust the computer in the care of Mac Ads Cleaner. If you find it hard to remove Mac Ads Cleaner from your device, you can just execute the guide on this page. This complete procedure will help you get rid of this rogue software easily. Combo Cleaner is a trusted Mac utility application with complete antivirus and optimization features. It is useful in dealing with adware and malware. Moreover, it can get rid of unwanted program like Mac Ads Cleaner. You may need to purchase full version if you require to maximize its premium features. 5. Wait until antivirus downloads it's latest virus definition updates and click on "Start Combo Scan" to start removing Mac Ads Cleaner. Before proceeding with the steps below, please close Mac Ads Cleaner window if in case it is open. 3. Under Process Name column, look for Mac Ads Cleaner. Click the name to select the malicious process. 6. You may now delete or remove files that belongs to Mac Ads Cleaner. Proceed to the next steps. Some malware also installs login item into compromised account under System Preferences. This object automatically runs Mac Ads Cleaner during user log in. 4. Next, select user account that runs Mac Ads Cleaner. 6. Select Mac Ads Cleaner from listed entries and click on the minus [-] button and confirm your actions. Please see image below for reference. If you cannot find the specified file, please look for any unfamiliar or suspicious entries. It may be the one causing Mac Ads Cleaner to be present on your Mac. Arranging all items to see the most latest ones may also help you identify recently installed unfamiliar files. Please press Option + Command + 4 on your keyboard to arrange the application list in chronological order. 2. Run Malwarebytes Anti-malware for Mac. It will check for updates and download if most recent version is available. This is necessary in finding recent malware threats including Mac Ads Cleaner. 5. After the scan, Malwarebytes Anti-malware for Mac will display a list of identified threats, Mac Ads Cleaner is surely part of it. Be sure to select all items in the list. Then, click Remove button to clean the computer. How do you start a class action against this company of dishonest people behind this fake Mac Ads Cleaner and other software produced by the same company? How do you put these low-life’s out of business once and for all? I just had a 1 hours phone call with these guys from India probably – and the only way they offered for me to get rid of their CRAP was to connect to my computer. So if anyone is up for some serious action against this company, leave a word here.